The cold weather can be public enemy number one on a dry haired girl's hair. This is especially true with relaxed hair due to the fact that it is already weakened with the chemicals so we really need to take extra special care of it. 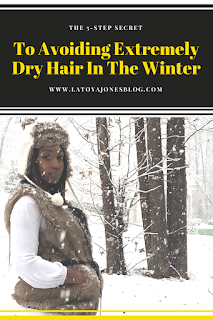 Cold weather has absolutely no humidity in it, meaning there is no moisture at all in the air, which results in hair that was already dry becoming even more dry. This is also the reason why our skin seems extra ashy when it gets cold versus when it is hot and humid outside. Here are 5 things you can do to avoid your hair and scalp from being so dry in the winter. Add moisture-The most important thing you can do for your hair when it is more prone to being dry is to moisturize, moisturize, MOISTURIZE. In order to do this you want to start with your shampoo and conditioner. Use moisturizing shampoos and deep conditioners (like these). Deep condition-I would suggest deep conditioning your hair once per week by sitting under a warm, hooded dryer for a minimum of thirty minutes. Always use leave-in-Also use a leave-in conditioner while your hair is still damp. Once your hair is about 80% dry, I would suggest using a light serum like by L. Jones Silky Serum Oil. Use oils & serums-Use the serums sparingly, as your hair will also create its own oils. Too much will weigh your hair down and cause it to look and feel oily and greasy. Once your hair is completely dry, style as usual. Use heat protectant-When styling your hair with heat, make sure you use a good heat protectant. Some leave-in conditioners (like this one) have heat protectant ingredients included in them and in that case, no extra is needed. Styling tools can dry the hair out, and cause it too look even drier than it normally would especially when it is cold. Heat protectants can drastically decrease this risk. If possible, opt for styles that don't require heat at all like roller sets, wraps, and rods. If your prefer heat, only use it once per week maximum. The winter months don't necessarily mean that you have to have bad hair days. Combat the weather with the proper moisturizers and you can still look good, despite the weather. Check out the video for this post here: Don't forget to subscribe while you're there!